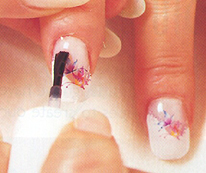 Here’s a potpourri of ideas you can try for making your nails extra special and eye-catching. Punch up your colours. Red and pink are fine, but what about bottle greens, deep purples and iridescent blues? Yellows and metallics, or even chrome finishes are striking too. Mix up a batch. 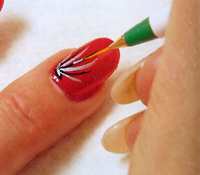 Try a couple of harmonising colours, like red and gold, on alternating nails. Or go seasonal; say, gold and mauve for Easter or red and green for Christmas. A light coat of glitter adds an eye-catching sparkle to any colour. Use it below the top coat. Plain glitter is the most versatile as it works with any colour. Try a stripe of lighter colour down the centre of each nail; for example, a thin stripe of bright red against a deep burgundy will add depth and richness. Go heraldic; paint a diagonal band across your nail, with different colours above and below. If you have a steady hand and a fine brush, try adding detailed designs to your “shield”. Get artistic. If you have an artistic flair, try painting miniatures on your nails. Simple designs like flowers, stars and butterflies work well. Experiment with different “canvases”: clear (natural), white or even deep blue or black can be used to great effect. Nail art kits of decals and stickers make elaborate designs easy. Seal with topcoat. Cheat. No artistic talent? Check out those nail decal kits. Apply them to naked or freshly polished nails, then seal them on with the top coat. Hundreds of designs are available. Try coloured rhinestones over silver polish for a stunning look that’s easy to do. Go opulent. Set tiny rhinestones (available at craft stores) in place one your nail while the polish is still tacky. Seal with topcoat. Watch out for snags on clothing. All kinds of effects are possible with an airbrush. > Handy with an airbrush? You can use acrylic paints instead of nail polish. Start with a white base to maximise colour richness and definition. Try blending contrasting shades down your nail. Try a yellowy-orange fading to a deep metallic purple. Try stripes. Try anything you like!